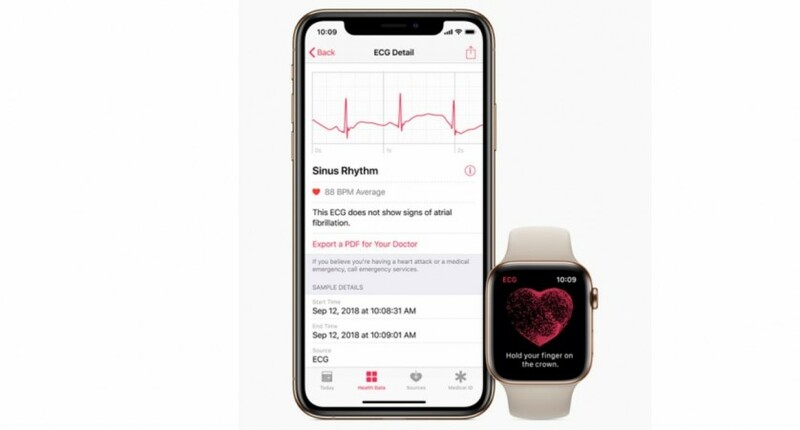 Apple's new Watch Series 4 owner detected a previously undetected AFib condition with the newly launched ECG app. It's been barely a few days since Apple rolled out the much awaited watchOS 5.1.2 update that brought the ECG (Electrocardiogram) app for Watch Series 4 and Irregular Rhythm Notification feature for several more Watch series iterations. Now, a report has emerged that ECG app has apparently saved Apple Watch Series 4 owner. The patient who goes by the moniker u/edentel on Reddit has claimed that he got an early diagnosis of the atrial fibrillation (AFib), previously unknown condition thanks to the ECG app. AFib if left undetected can cause stroke and is said to be a second most common cause of death in the world. 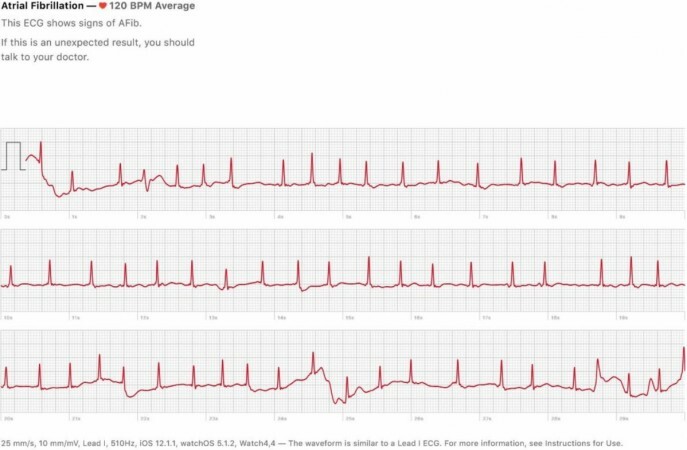 The patient u/edentel was excited to test (tutorial below) the ECG app on his Watch Series 4 (review) and in his trial, the result came out with a warning that Afib has been detected and needs medical attention. Thinking it might be a glitch, he tried testing it on his wife and it came out inconclusive and one final time, he performed the same test, it came out with same results classified as Afib. Without wasting time, he went to the Patient First early in the morning at the nearby hospital. Doctors performed regular tests in addition to ultrasound of the heart. When the lab technician saw the results on the board, he said will be back with the doctor. 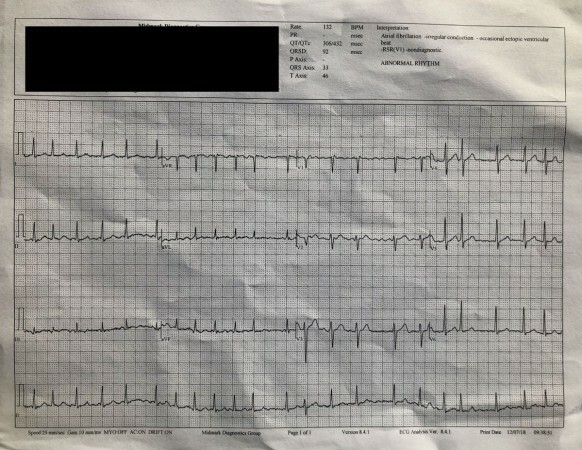 To his shock, the doctor said he was indeed suffering AFib and the ECG app on Apple Watch Series 4 literally saved his life. "You should buy Apple stock. This probably saved you. I read about this last night and thought we would see an upswing this week. I didn't expect it first thing this morning," the doctor said to u/edentel. He has shared the two comparisons of Apple Watch Series 4 and the lab tests. He is scheduled to go back to the hospital in a week for some additional tests to start looking at the real cause-- blood, thyroid or any other aspects. The new electrodes built into the back crystal and the Digital Crown of the Apple Watch Series 4 works together with the ECG app to enable customers to take an ECG similar to a single-lead reading. Step 1: Launch the ECG app on Apple Watch Series 4 and hold your finger on the Digital Crown. This will complete the circuit and the electrical signals across their heart will be measured. Step 2: After 30 seconds, the heart rhythm is classified as either AFib, sinus rhythm or inconclusive. Apple, a well known strong advocate of the user privacy, has assured that all the data and the associated classifications including any noted symptoms will be stored securely in the Health app on iPhone. Users can share a PDF of the results with physicians. Despite the aforementioned story, the ECG read-out and Irregular Rhythm Notification from the Watch Series 4 and later Apple watches, if the results come positive any heart ailment, you should never panic. Apple devices do diagnosis based on two electrodes (one on the crystal case below and another in the Digital Crown and sometimes it might show false positive for AFib condition. In hospitals, doctors usually check with bigger instruments with 10 electrodes placed on different parts of the body to offer 12-lead reading, which will reveal the closest source of the cause. So, if you get AFib or any other heart abnormal heart readings on the Apple Watch far too many times, it is in best interest you consult your doctor, but most importantly never feel anxiety and remain calm during the whole procedure. Even if you are diagnosed with any heart condition, you have to take proper medicine and make strict life choices in terms of routine exercise and develop healthy food habits. Stay tuned. Follow us @IBTimesIN_Tech on Twitter and on Google News for the latest updates on Apple.